In mid-2012, Bankwest marked a milestone in a history that began in 1895, with the relocation of its corporate headquarters to the exciting and innovative new Bankwest Place in central Perth. Stott Hoare has served Bankwest since 1989, providing a wide range of IT services including procurement, hardware maintenance, software licensing, lifecycle management and technical support across an extensive national capital city and regional network. When Bankwest sought specialist IT services to assist them with the relocation, they approached Stott Hoare and other IT providers. Through a competitive tender process, Stott Hoare was able to demonstrate that it had the skills, experience and flexible resourcing to provide the required services at an attractive price. The Bankwest project was much more than a traditional corporate office relocation. A central platform of the Bankwest move was the adoption of Activity Based Working or ‘Happy Working’ as it was termed. Activity Based Working meant that the 3,000 head office staff would not have traditional offices at Bankwest Place. Instead, each would have a laptop which they would use as they moved between different workstations within the new 21-level building, depending on the tasks they were assigned. To facilitate this significant transition, Bankwest decided that the new technology should be implemented in its current workplace environment to familiarise staff and ensure ease of operation from day one at Bankwest Place. Clearly, the success of the project was absolutely critical to Bankwest maintaining its prominence and great reputation in the banking industry. Stott Hoare provided the technical resources to prepare 3,000 new laptops for deployment and completed all the relocation, installation and support work necessary to ensure they were ‘ready to go’ for Bankwest staff at workstations in the new Bankwest Place. Stage one of the project required Stott Hoare to assist with the new laptop preparation process including software image installation and a full implementation of the workplace technology at the current workstation locations. This phase also involved connecting to the Bankwest network and the installation of IP telephones and peripheral equipment. Once everything was up and running and staff had the opportunity to become familiar with the new technology, it was relocated in its entirety to the new work environment at Bankwest Place ready for their arrival. “This was a very substantial IT preparation and relocation project indeed,” said Brian Hawkins, Stott Hoare Sales Manager. Throughout the entire project, Bankwest needed to seamlessly maintain services to its staff and more than 600,000 customers across Australia. By utilising Stott Hoare’s specialist services, the Bankwest IT team was able to continue its critical core business functions secure in the knowledge that the comprehensive experience and technical skills of the Stott Hoare team would ensure that the new technology implementation and relocation was completed to the highest standards of efficiency and quality. “Successfully completing all aspects of this demanding project has firmly established Stott Hoare as one of Western Australia’s foremost specialist IT expansion and relocation services providers,” said Brian. As previously outlined, Stott Hoare’s services for the Bankwest Place project were divided into two distinct stages. The stage one implementation of the new laptop-based workplace technology for staff in their current premises would allow them to make the transition to the new technology before physically relocating to Bankwest Place. To achieve this goal, Stott Hoare assisted with the preparation of 3,000 new laptops, including imaging, supplementary software installation, integration to the Bankwest network, quality assurance testing, telephony installation, and connecting and testing peripheral equipment to ensure all workstations were appropriately configured. Beginning in late 2011 the laptop preparation, installation and connection stage involved a team of 12 Stott Hoare technicians and a project manager over a four-month period. The second stage of the project involved Stott Hoare assisting with the relocation of the new workstation technology to Bankwest Place and providing on-site support to ensure optimal productivity from day one. The Stott Hoare team repacked the equipment for safe transport and installed it at Bankwest Place. This involved deploying monitors, keyboards and docking stations, network connectivity, an innovative cabling system, ergonomic workstation equipment and IP telephones in preparation for staff arriving with their new laptops. Bankwest’s adoption of Activity Based Working has made it a workplace technology leader and an employer of choice for personnel appreciative of the productivity gains and improved interaction this innovative workplace environment delivers. The transition was supported by Veldhoen and Company, the Netherlands firm credited with devising the concept some fifteen years ago. Microsoft Amsterdam and Commonwealth Bank Sydney headquarters have also adopted this new way of working. The Activity Based Bankwest Place environment is designed to enhance mobility and flexibility, using information technology to allow staff to move between different work settings and floors within the building depending on the work they need to undertake. It also provides more flexible working options as every colleague, no matter what area of business they work in, has a laptop computer. Sections of floors are tailored to different activities; ‘hubs’ for smaller groups and individuals; ‘clubhouses’ are more collaborative areas for meetings and brainstorming. The ‘Happy Working’ concept was road-tested on a pilot floor at Bankwest from April 2011 and staff feedback was described as ‘overwhelmingly positive’. Bankwest is already finding Activity Based Working is improving satisfaction and productivity for its 3,000 head office staff, as well as enhancing sustainability by reducing its use of office space, energy and paper. “Stott Hoare is proud of its long-term partnership with a client as prestigious and progressive as Bankwest,” said Jim Loader, Stott Hoare Managing Director. “The Bankwest Place implementation and relocation was also a very significant project for Stott Hoare, as it firmly positions us as one of the foremost State and regional specialist IT expansion and relocation service providers. “It’s an area we see continuing to expand in coming years, as many large organisations embrace new information technology solutions to empower their staff to work more flexibly and effectively. 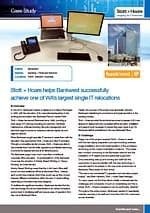 “Stott Hoare is also progressively at the forefront of the implementation of secure, flexible and mobile solutions that enable IT professionals to deliver strategic outcomes that better fulfill business objectives,” concluded Jim. To discuss how we can provide a cost-effective end-to-end solution for your requirements, please contact us on (08) 9244 0000.